Sponsors: CNN, WMUR-TV and the New Hampshire Union Leader. Candidates: Sen. Sam Brownback, former Gov. Jim Gilmore, former Mayor Rudy Giuliani, former Gov. Mike Huckabee, Rep. Duncan Hunter, Sen. John McCain, Rep. Ron Paul, former Gov. Mitt Romney, Rep. Tom Tancredo, and former Gov. Tommy Thompson participated. [all 10 of the major declared candidates]. Moderator: CNN's Wolf Blitzer. WMUR-TV political director Scott Spradling and New Hampshire Union Leader State House bureau chief Tom Fahey also asked questions. Audience: There were approximately 750 people in attendance at each debate. Applications for seats were made through the New Hampshire Political Library and through the New Hampshire Institute of Politics at Saint Anselm. Seat applicants were asked for name, dob, and contact information as well as voter registration from previous elections. About 100 undecided registered Republicans and Independents likely to vote in the Republican primary, identified with help from the New Hampshire Political Library and the Institute of Politics, then interviewed by CNN producers, were seated in a red zone. Blocks of seats were given to all debate partners including WMUR-TV, the Union Leader, Saint Anselm and CNN as well as both the state and local party, elected officials, campaigns (10 seats each) and ambassadorial observers. Broadcast: CNN and WMUR-TV. Additionally CNN made the debate coverage available to the public without restrictions. Format: Two hours, commercial free. Two parts. In the first hour the candidates, standing at their lecterns, took questions from Blitzer, Spradling and Fahey. In the second hour, the candidates sat in chairs at the front of the stage and took questions from members of the audience, facilitated by WMUR-TV's Jennifer Vaughn. 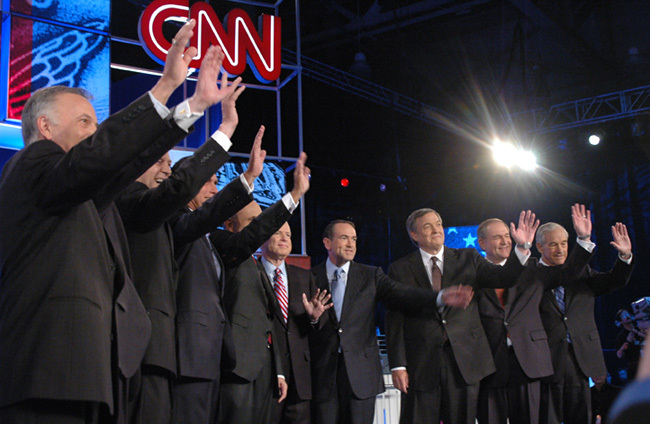 Background: A Democratic debate occurred on June 3. These two debates were initially scheduled for April 4 and 5. -CNN built an elaborate set for the two debates in the Sullivan Arena, which is the home for Saint Anselm ice hockey. -Former Sen. Fred Thompson, who just days earlier started testing the waters and is already seen as a possible leading contender, did not participate. -Several events were held around the time of these debates. The New Hampshire Democratic Party held its 2007 Midterm Convention on June 2 at Rundlett Middle School in Concord. The New Hampshire Republican Party held its First in the Nation Presidential Gala on June 6 at the Raddison Hotel Expo Center in Manchester. Additionally ED in '08 held a launch event in Manchester.